If you are looking for the Grow Your Blog post scroll down or go here. 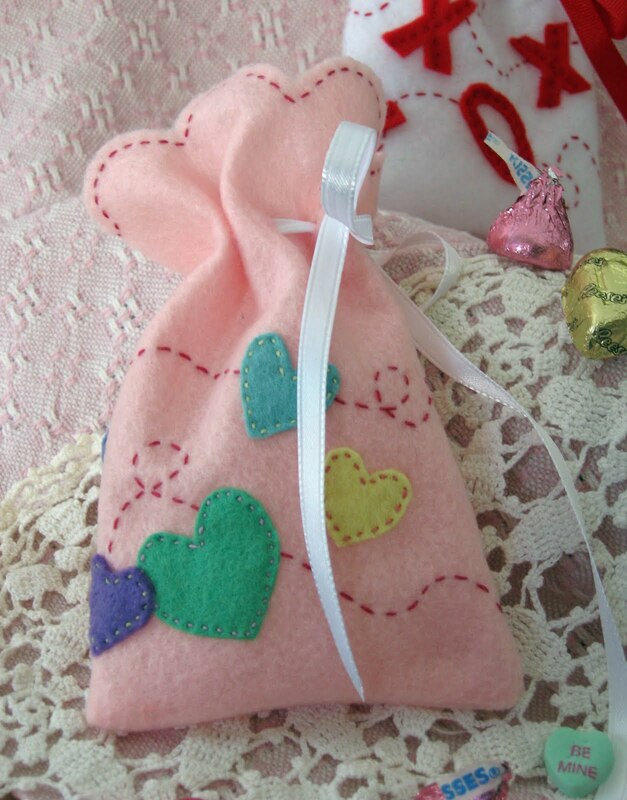 There are so many darling Valentine's projects out there! Searching for some ideas was a lot of fun and I couldn't resist trying my hand at this cute rose kissing ball. It was easy and needed very few materials - just two rolls of crepe paper, a Styrofoam ball and a glue gun. The directions are linked below along with links for some other really great Valentine's Day decorating and gift ideas. I hope you have fun checking them out and making one or two. Which one is your favorite? It's time for a blog hop! I'm participating in Grow Your Blog sponsored by 2 Bags Full which goes from 1.25.15 until 2.15.15. 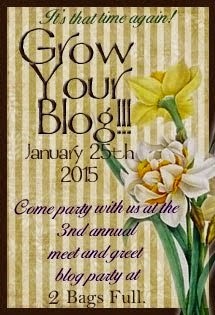 What a big job hosting a blog hop must be so many thanks to Vicki our host. If you are new to my blog, and I'm hoping many of you are, let me tell you about myself. My name is Susan and I live in Wisconsin USA. 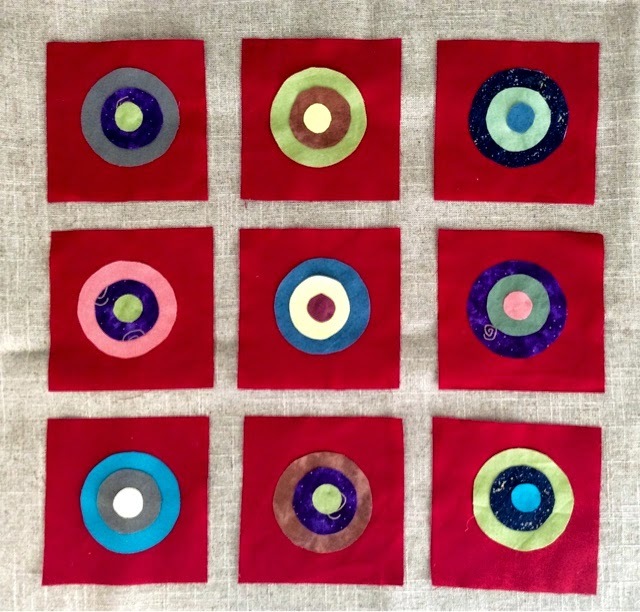 I love to create with fabrics and fibers and include sewing, embroidery, knitting, and weaving in my bag of tricks. I also like to cook so on my blog you'll find recipes scattered in among the art projects, tutorials and links. I've tried over the years to limit myself and focus on one thing but it never works. I feel so sad to leave something out so, I don't. Often there will be more than one technique in the things I create so having a large bag of tricks is helpful! 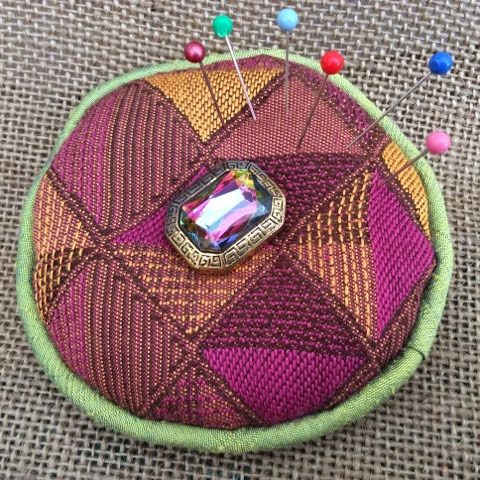 Please leave a comment on this blog post...I'd love to hear from you and you will be entered in a drawing for this sparkly pincushion. One can never have too many pincushions! I will draw the winner on the 15th. Please be sure I can e-mail you from your comment! Thanks for stopping by. Nose around my blog for awhile and if you enjoy it, there are two ways to follow me...e-mail or Google Friend Connect located at the top left of my sidebar. Then go here to find links to other amazing places to explore. 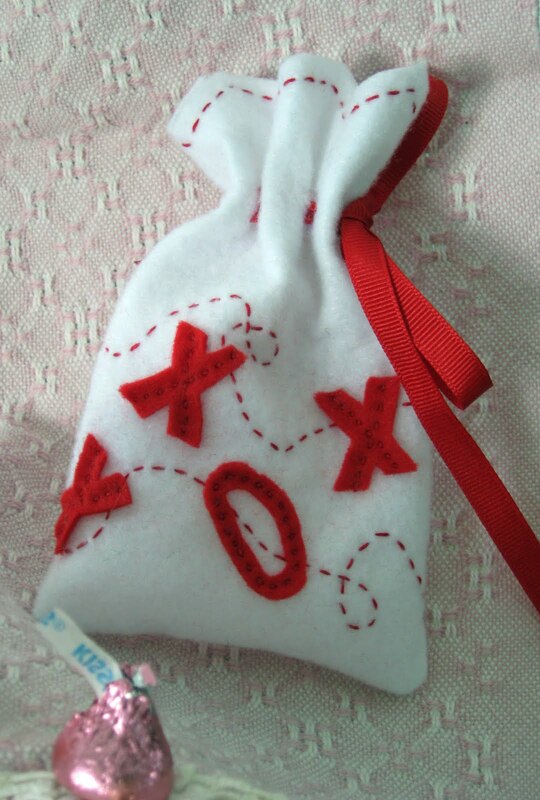 Because Valentine's Day is just around the corner I thought you might want to make a few of these cute little bags for special people in your life. Fill them with little trinkets, cookies, candy or special gifts! This post is a few years old but it kept calling to me so it is getting a re-post. Go here for complete instructions on how to make them. 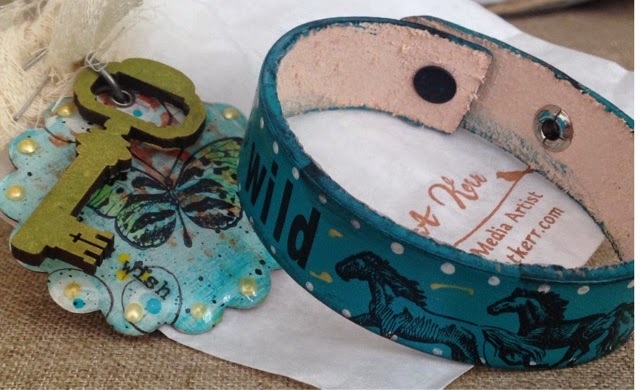 There was a great surprise in the mail yesterday...this fabulous leather cuff and charm from mixed media artist Cat Kerr. I won it from her blog drawing. Go here to see her blog. I don't know if you've noticed but there have been some updates to Threads of Inspiration. I've added a tab bar at the top that will help you find recipes and tutorials more quickly. More tabs will be coming soon! 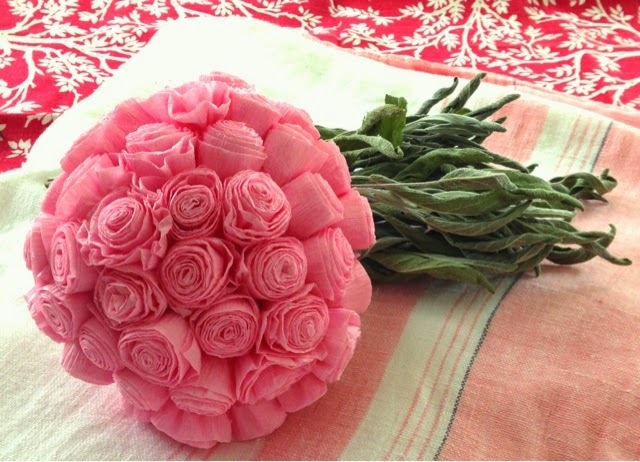 Coming soon will be a lovely link list of Valentine's Day ideas...food, crafts and tutorials. What are you doing to celebrate Valentine's Day? Oh, and let me know how your Valentine Bags turn out! Every January The Riverfront Art Center (my favorite local art venue) has a yearly show called Winter's Garden which opens this Friday. The gallery will be filled with artwork of all mediums whose subject is gardens. Walking into the space is such a welcome relief from the shades of winter white outside. Along with the art will be live orchids, violets and cyclamen for sale. This is a great fundraiser for the center and the plants brighten up the homes of the recipients. 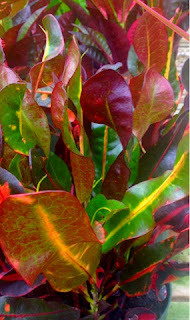 Today I had the good fortune to go to the wholesale greenhouse with the director to pick up the plants. 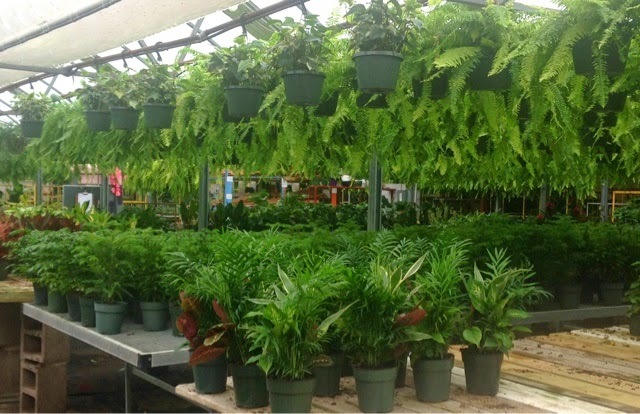 How wonderful to see all of this greenery! 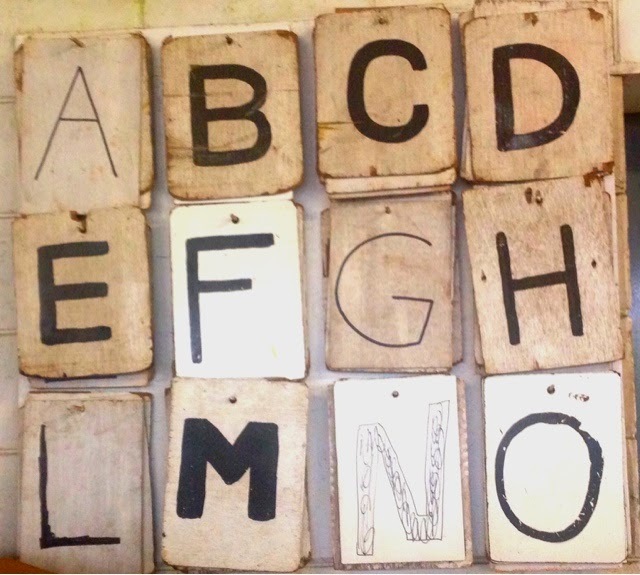 This board of letters was hanging on one of the walls. I have no idea what it is for but being obsessed with grids these days I couldn't resist snapping a photo. Very wabi sabi. How are you brightening up your January? After writing about shopping my stash I figured starting a project to use some up would be a good idea. I am not exactly sure what this is going to be but I love the intense red and working with a grid. When there were only four squares cut out they were going to be coasters but that didn't bust much stash, so now there are nine. Still not much used up so there is a nice stack of red squares waiting to be added into the design. We'll see how big it gets. Last night while watching a movie I finished this cowl. It's made out of Alchemy Yarns of Transformation's Silken Straw and Temple. 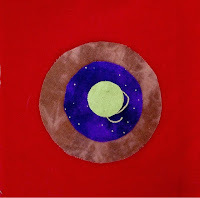 To finish, it goes in the washing machine to be lightly felted, which happens tomorrow after the big game (Go Packers!) ...or maybe Monday. The garter stitch design disappears when the wool is felted and the silk drapes beautifully. I saw this made up last spring when I was at the Minnesota Yarn Shop Hop at Steven Be's and fell in love with it. 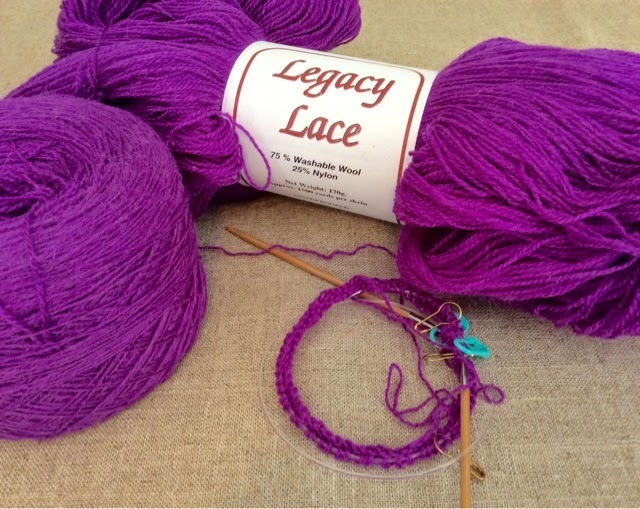 The next project is a sweater made out of lace weight. Call me crazy. 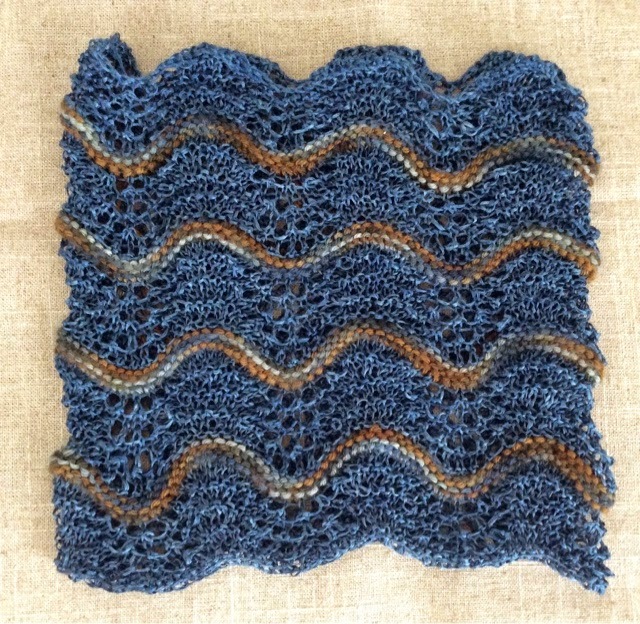 I did a small swatch to get gauge and it drapes beautifully. The swatch knit up easily but working the first few rows has been a little frustrating but I'm going to carry on. 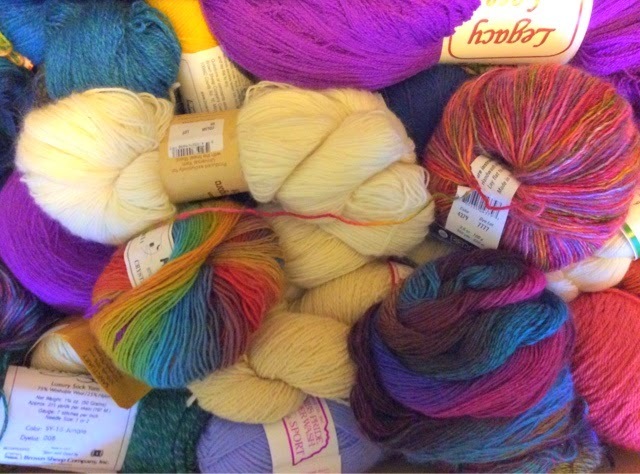 Have you started any stash busting projects? 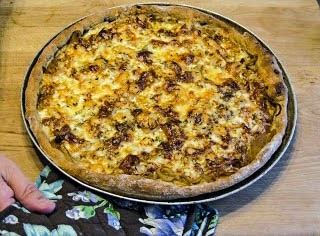 Sticking with the onion theme I wanted to share with you one of my favorite pizza recipes for Onion and Cheese Pizza that I posted quite awhile ago on my old blog Threads of Wonder. The pizza has a homemade whole wheat crust, mustard, caramelized onions and fontina cheese. Don't be thrown by the mustard - it gives a nice tang which is offset by the sweetness of the onions and the saltiness of the cheese. If I could still eat dairy I would be making this tonight. Here is the link to the recipe. It's time for some stash busing! I know I said I wasn't going to make any resolutions but I have been thinking seriously about ways to clear out some of my stash. 2015 is going to be the year! 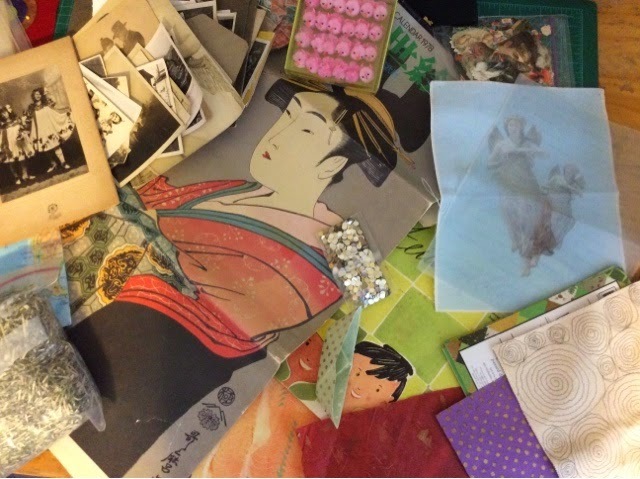 As I mentioned in my previous post I like to do a lot of different things so I have yarn, fabric, beads and buttons, paper, photos, found objects, hand carved stamps and all the tools and equipment needed for creating with all these gems. Plus, with the advent of Pinterest, one of my favorite sites of all time, I'm always filled with new ideas. My studio is tiny so bringing in more materials makes what space I do have a challenge. So, I've decided to start shopping my stash. In addition to that I believe I will start filling my etsy shop, which has sat forlornly empty, with the creations! Sandy Leigh at Eat, Write, Dream, Stitch was thinking the same thing and came up with a Stash Dash and five simple rules to help out. If you're thinking you might need a little stash dash head on over to her blog and see her plan. I'm going to undertake some book making and use the amazing Japanese calendar that's in the top image for the covers. It's a really large calendar so I should be able to make several Japanese ledgers. I'll post pictures when I get them done. What is the most interesting thing in your stash? What are you going to do with it? Yarn stash--some great colors in there! I just finished reading Steal Like an Artist by Austin Kleon, a small book and a quick read. It made me want to run to the studio and kitchen and start making stuff. The book is filled with little bits of wisdom and witticism that anyone that creates can relate to. My favorite piece was called "Don't throw away any of yourself." The idea is that we all have multiple interests and we shouldn't leave one behind to only pursue the other. Eventually you'll feel like you've lost a part of yourself. This struck home for me because I love being in the kitchen cooking away, the studio stitching like a crazy person and the garden watching it all happen. When I read articles about blogging and choosing one focus it makes me a little nutty. I'm not sure what to leave out because it wouldn't be me if I had to cut out the others. This is not a new problem for me. 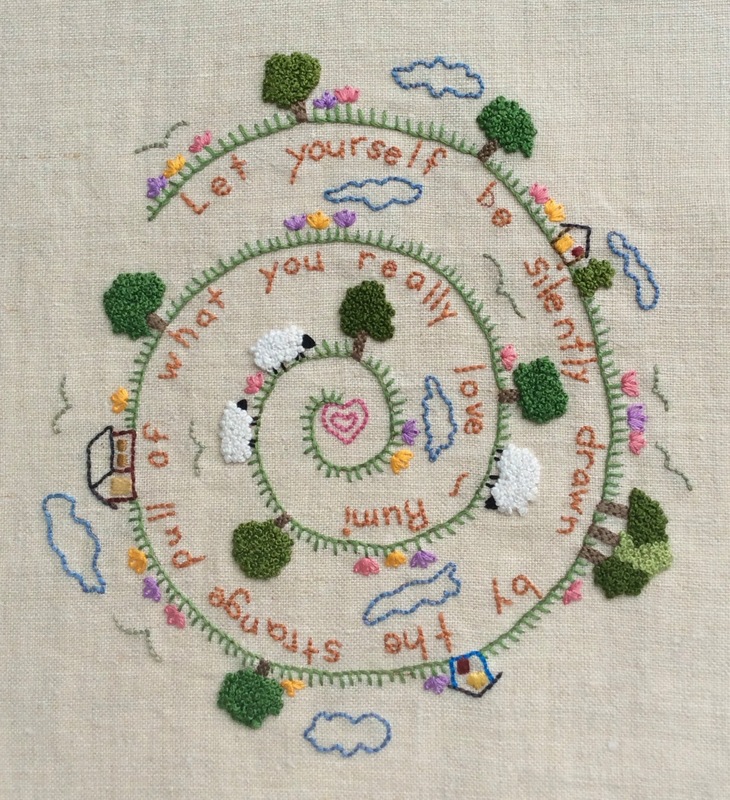 I went to art school to study textiles thinking I would then narrow down my focus. Unfortunately I came away having had an amazing time but about a zillion more tricks in my bag. Afterwards I was not a fun person to live with because I kept trying to figure out what path to take. I eventually decided to focus on something where I could use as many techniques as I wanted. 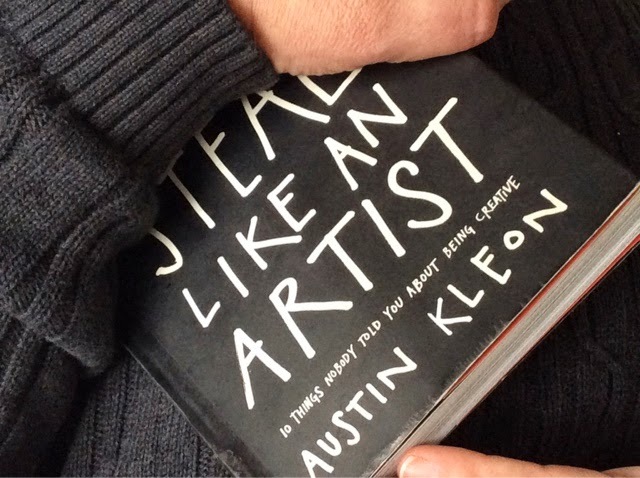 Austin Kleon gave me permission to revel in it all. I'm grateful. 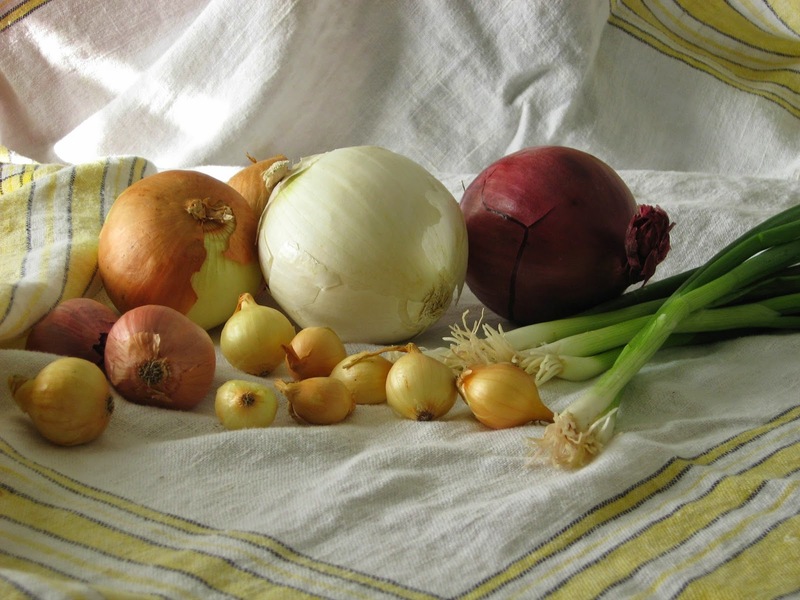 Assortment of onions - yellow, white and red, shallots, pearl and green. I've been thinking for awhile about posting some kitchen basics. Utensils and kitchen equipment were a possibility but settled on foods I can't be without. On the top of my list is onions. Most of my favorite dishes start with sauteing some onion....soup, curry, pasta sauce and hamburgers get topped with a large helping of sweet fried onions. They are versatile and can be eaten in every way imaginable from strong and raw all the way to golden brown, sticky, caramelized deliciousness. One of the major drawbacks in cutting onions is the burning and crying that results from the chemical allyl sulfate that is released. 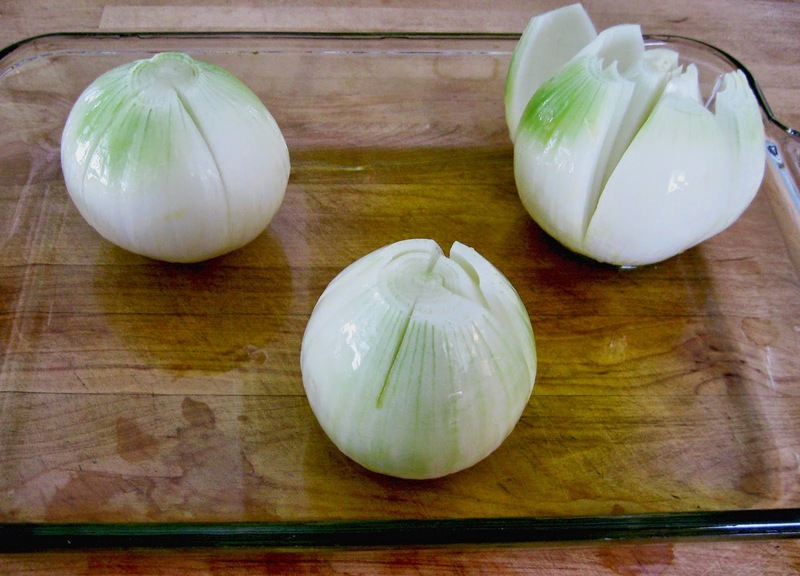 Using a sharp knife helps but I have been known to wear my swimming goggles if I have a large number of onions to dice. It looks weird but it doesn't sting! On the bright side the more allyl sulfate an onion contains the longer its shelf life. 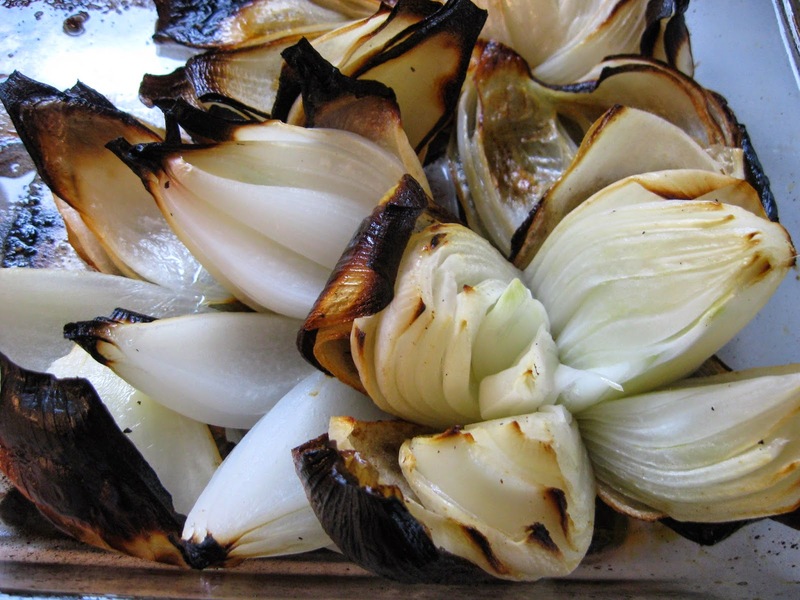 Roasting is one of my favorite ways to prepare most any vegetable, and onions are no exception. I tried these out and they were delicious. However, I must warn you the oven temp is very high and it caused a bit of a calamity when all of our smoke detectors went off. I hope the tasty soup I'm going to make with these will make my husband happier than the alarms did. These would be great served as an appetizer with Ranch dressing or a great addition to soup, pizza or pasta. Put 2 Tablespoons of olive oil in a 9 x 13 pan and coat the bottom and sides. Cut the bottom off of the onions so they will stand upright. Cut an X into the top without cutting all the way through. Oil the outside of each onion. Roast for 30 minutes. Check to see if there is still oil in the bottom of pan and drizzle the remaining oil in pan and onto onions. Roast for 10-15 minutes more. They may be charred at the tips but just cut the blackened parts off. Onions ready to go into the oven. Before the new year arrived I was hearing a lot about whether to make resolutions. Some suggested that instead of making resolutions make goals. I'm not exactly sure what the difference is. Others chose to have nothing to do with any of it. My sister-in-law has been simplifying her life by downsizing her belongings and eliminating activities she doesn't find fulfilling, a laudable goal and I am inspired by her. So, I pondered that for a bit. If I had made resolutions/goals/whatever they would be the usual. You know, eat healthier, exercise more, blog more, clear some clutter, learn all sorts of new things - a language, perhaps. Actually the mere act of going through this list makes me cranky. A new year does make me want to begin something new and different. Unlike my sister in-law I kind of like stuff. Except the stuff in this drawer. It is a mess. 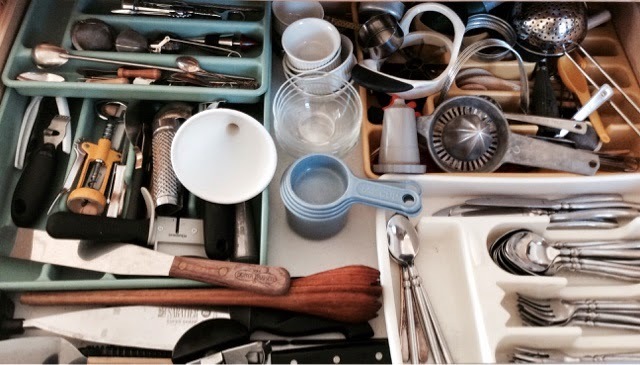 My resolution, it turns out, is to clean out this kitchen drawer. Perhaps tomorrow.